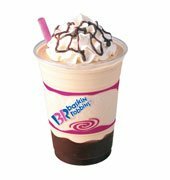 Taste of coffee with the indulgence of BR thick shakes! 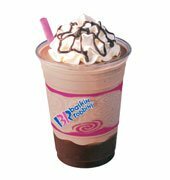 Thick shake made with Jamoca Almond Fudge ice cream with one level ladle of Hot Fudge topping added to the base and topped with one dollop of real cream and drizzles of chocolate syrup. Get set for a thick, frothy shake with the classic Jamoca ice cream resting on one level ladle of Hot Fudge topping and topped with a dollop of real cream dripping with chocolate syrup.